Randy Burke, Owner and Director Of Bluewater Adventures signed up to speak at the Northern GatewayPipeline hearings that are currently being held in Vancouver, BC. He spoke on the morning of Tuesday, January 15th, 2013, presenting to 4 panel members. Recognition: This meeting is happening in the traditional territory of the Coast Salish. I have been a professional mariner and Captain for the last 30 years along the British Columbia coast and since 1988 been the owner of Bluewater Adventures Ltd. Bluewater Adventures is an award-winning nature cruise company, based in North Vancouver. Founded in 1974, we are one of the first ecotourism companies in BC. I have 8 year round employees and an additional 20 seasonal employees. Bluewater Adventures sells the “Super Natural BC” coast, and relies upon intact wildlife populations, the protection of wildlife habitat, and dynamic Coastal First Nations communities for our business to survive and flourish. I believe this coast provides the finest tourism experience in the world – it equals the beauty of New Zealand and Norway, and no where else do you find whales in such abundance, and wilderness dependent species like grizzly bears and wolves to watch. · One of our main destinations is the Great Bear Rainforest; and lower Douglas Channel is critical to our operations. · Researchers at Cetacea Lab estimate there are 100 humpback whales regularly in the lower Douglas Channel area. It is recognized as critical habitat for northern resident orcas, and one of the only places on the coast where fin whales – the second largest whale on the planet - come inshore to feed. 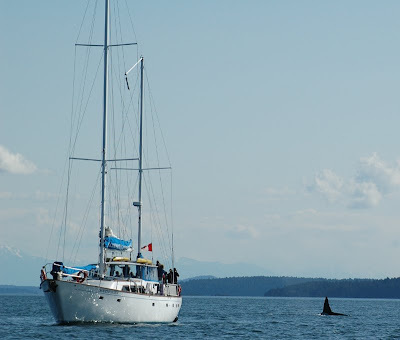 · In 2012, we found there were more whales in the lower Douglas Channel area than anywhere else on the coast. · Northern Gateway puts a superhighway right through the living room of these whales. The sounds from these ships will impede whales from communicating, feeding and destroy this critical habitat. Collisions with big ships have already been reported, with two cruise ships entering Vancouver with dead fin whales wrapped around their bows. · The industrialization of this area is in direct opposition to the wilderness product I provide. · Bluewater Adventures’ Great Bear Rainforest trip was named one of 50 Canadian Signature Experiences by the Canadian Tourism Commission. They designated a visit to the Great Bear Rainforest as iconic of Canada; one of the truly unique experiences Canada has to offer visitors from around the world. · The January, 2013 edition of National Geographic Traveler magazine names the Great Bear Rainforest one of “20 must-see places”. · Bluewater Adventures has signed First Nation protocol agreements with the Gitga’at of Hartley Bay, the Haisla in Kitimat, and Kitasoo / Xaixais in Klemtu recognizing their inherent rights and traditional territories. We operate with their permission and stand with Coastal First Nations in opposition to this project. - Northern Gateway and specifically, tankers transiting from Kitimat, through Hecate Strait and Dixon Entrance, risks the very existence of my business. Why are the risks too great? In their submission Enbridge uses averages for weather and wave height that grossly underestimate the risks of high winds and high waves. In particular, the submission does not address the risks if winds, waves, currents or poor visibility are combined. Environment Canada employees at Cape St James reported 100 foot waves just offshore. These occurrences are not mentioned in the averages submitted by Enbridge. As a mariner who has spent the last 25 years sailing Hecate Strait, I can assure you it is not the placid ocean depicted in Enbridge’s submission. Hecate Strait has been described as one of the most dangerous bodies of water in the world. Carriage of oil by third party carriers. Enbridge presents a misleading picture as IF they are responsible for all of the transportation of bitumen and condensate. In reality, they would buy and sell from the Kitimat terminal and have no responsibility after that point. The carriage of the bitumen and condensate would be arranged using foreign ships, mostly operating under “flags of convenience”. It is the ship owner who is responsible, not the product owner in the event of an oil spill. In many cases, the ship owner is merely a holding company and when a major liability arises each individual ship can be written off bringing into question who is accountable for costs of cleanup. (Major Marine Vessel Casualty Risk and Response Preparedness in British Columbia EnviroEmerg Consulting for Living Oceans). The legal limit of liability in Canada combined with available international funds for oil spills amounts to just $500 million. When we have examples of both the Exxon Valdez and Deepwater Horizon spills costing billions, if we had a major spill in Canada the citizens of Canada would be responsible for the clean-up. It is entirely irresponsible for Canadian citizens to be taking the risks for the profit making efforts of Enbridge. Enbridge does not detail the effect of an oil spill, only the likelihood of its occurrence. Again the use of averages in the submission distorts the picture so it appears so unlikely, it is hardly worth worrying about. Yet as pointed out in the combined submission of Raincoast Conservation and partners, who quote Anderson & Labelle in Spill Science Technology Bulletin, “Enbridge Gateway would be expected to experience 7 spills from tankers or port operations over 1,000 barrels during it’s 30 year life”. Before this project can be considered for approval I want Enbridge to show how it would clean up a major spill and what effect it would have on the BC coast. 20 years after the Exxon Valdez, oil is still just under the surface on the beaches, some wildlife populations have never recovered; what exactly did the expenditure of billions of dollars in clean-up efforts achieve? Almost all the clean-up technology on the BC coast is designed for surface clean-up and containment of crude oil. Yet bitumen is likely to sink. How can the Joint Review Panel approve a project without viable, mitigation clean-up technology? It is not acceptable to have 10% or 30% recovery and call that success. And Deepwater Horizon demonstrated the use of dispersants is dangerous, with many unknown effects, particularly on human health (WWF Canada). - The purpose of the Gwaii Haanas Tour Operators Association is to represent the interests of visitors and tour operators to the Gwaii Haanas National Park Reserve and Haida Heritage Site. There are 20 member companies in the Association. - National Geographic rated Gwaii Haanas the number 1 national park in North America. - My company's Gwaii Haanas tour was rated “One of 50 of the Worlds Best Tours”. - The southern tanker route would come right past Gwaii Haanas and an oil spill that affected Gwaii Haanas would ruin a world-class gem. - I note the southern tip of Gwaii Haanas, Cape St. James has the distinction of having the “highest average winds of any light station in Canada”. The Association was formed to promote sustainable bear viewing and the protection of wild bears and their ecosystems. 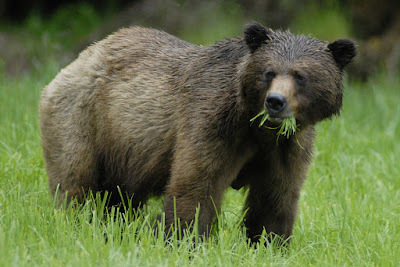 - Bear viewing is demonstrating tremendous growth and interest from around the world. The British Columbia coast is not only one of the last remaining places in the world where you can view grizzly bears, but it is home to the unique, Kermode or Spirit bear (Ursus Americanus Kermodei). This all-white bear is a black bear created by the prevalence of specific recessive genes in one small area of the BC Coast. - The area with the highest concentration of Kermode bears is right on the tanker route down Douglas Channel. - The Kermode bear is the provincial mammal of BC, yet Enbridge’s submission does not recognize this animal, provides no evidence how their proposal would affect these animals or how they would mitigate negative effects from increased shipping or an oil spill. - The value of Kermode bear viewing alone is estimated at $1.5 million in 2012. - Our reputation is paramount. It is very difficult to put a figure on the value of a good reputation, or the cost of losing it. What we are proposing here is risking the very reputation that British Columbia has spent decades and millions of tourism dollars promoting – namely a beautiful British Columbia coast, full of wildlife. - I was in business when the Exxon Valdez spill happened over 700 km away. I received several concerned calls asking what effect the spill would have on our tours and whether we were going to cancel any tours. People do not understand regional geography. - After the Deepwater Horizon disaster in the Gulf of Mexico, how do you feel about spending your holiday on the Alabama coast. Hesitant? Do you know if all the oil has been cleaned up? How many years does it take before we let go of that fear, or is it spoiled in our minds forever? - After this process, any oil spill on the BC coast is going to get tremendous media attention. Any significant spill will “tar” the reputation of the BC Coast for decades to come. - And the effect will be well-beyond its geographical boundaries. It won’t matter that the spill may be near Hartley Bay, people will cancel their holidays to Gwaii Haanas and northern Vancouver Island. - I can assure you a major oil spill in the Great Bear Rainforest will reduce our business by an estimated 20-30%, and that is enough to put us out of business. Not just Bluewater Adventures, but the 20 members of the Gwaii Haanas Tour Operators Association and the majority of the members of the Commercial Bear Viewing Association. The precautionary principle says this project should not be approved. There are greater risks than the proponent has recognized, and specific ones that cannot be mitigated effectively. When one industry’s proposal jeopardizes thousands of tourism jobs, simply to create a few hundred mostly short term jobs it does not make sense. When the risks of this proposal can ruin coastal tourism for decades, it does not make sense. Coastal ecotourism cannot co-exist with Northern Gateway. I urge you to turn down the application. I appreciate this opportunity in democracy. I trust that my voice and the voices of British Columbians will be heard, respected and acted upon. Thank you for speaking up against Northern Gateway pipeline. I listened to your presentation by webcast, and appreciate your commitment in bringing your experience and valued perspective before the Panel. Here's hoping they are good listeners! ﻿﻿﻿﻿﻿﻿﻿Khutzeymateen, a place I had never heard of, became my first foray into the wilderness. ﻿My apprehension over the word ‘bear’ was soon dispelled as we entered the Khutzeymateen Grizzly Bear Conservatory under the learned ‘Bear Whisperer’ Barrie Gilbert’s tutelage and guidance. We walked their paths, following footprints embedded in the earth, finding their resting places, their rub trees and learned of the biology of these great carnivores. ﻿﻿﻿﻿﻿﻿﻿﻿﻿﻿﻿﻿﻿﻿We soon learned that the this place is not just about bears, and that other animals benefitted from this sanctuary as well. Animals like wolves, wolverines, deer, and others live as they should in surroundings natural to them. Because visits to the Khutzeymateen is limited to few tourists every year, it remains pristine and we soon appreciated that our presence was a privilege. “Walk softly, Tread carefully, and listen”…SGang Gwaay – previously named Ninstints (after one of the village chiefs) is an ancient Haida village, located on AnthonyIsland, at the southern end of Haida Gwaii. 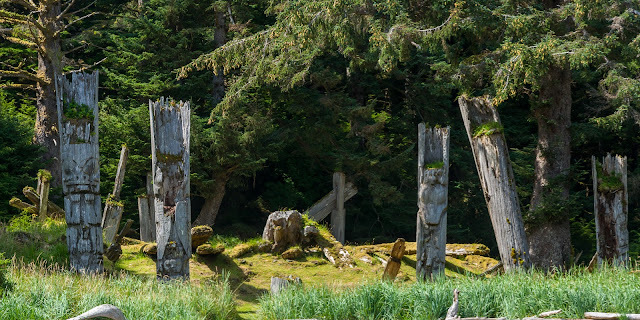 Accessible only by boat or plane, it is a UNESCO World Heritage Site, and contained within the National Park Reserve and Heritage Site, Gwaii Haanas. But even if it didn’t boast all the formerly mentioned credentials, it would still remain one of the most magical places on our coast. One aspect of SGang Gwaay’s magic is the stories that contribute to the village’s history. For several thousand years it was the home of the Kunghit Haida, historically some of the most feared warriors on the west coast. When the small pox epidemic hit in the late 1800’s, SGang Gwaay’s population was decimated from around 300 to 30 and those who survived moved north to Skidegate. The village was abandoned in 1884. Bluewater Adventures has been enriching lives by bringing travelers to nature since 1974 on award-winning expeditions.